Gunnison sage-grouse (Centrocercus minimus) are charismatic birds known for their elaborate mating ritual where males congregate on leks (breeding grounds) and strut, or “dance”, to attract mates. Leks are typically open areas with short vegetation within sagebrush habitats, often located on broad ridges, benches, or valley floors where visibility and hearing acuity are optimal. Gunnison sage-grouse are most easily identified by their large size, dark brown color, distinctive black bellies, long, pointed tails, and association with sagebrush habitats. During the breeding season, males have conspicuous filoplumes (specialized neck feathers), a black bib on a white upper breast, and yellow-green air sacs on the chest. They are Gunnison sage grouse, and they’re rapidly strutting their way to extinction. 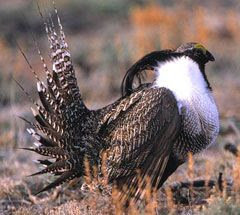 The Greater Sage-Grouse (Centrocercus urophasianus) is a handsome bird in the family Phasianidae. Distributed throughout 11 western states and two Canadian provinces, greater sage-grouse are gorgeous creatures, as evidenced in the National Wildlife Federation photo above. Boldly dressed in black, brown, and white, males boast long, sharp tail feathers and dazzling display plumage. During mating season, they sport fancy filoplumes and inflatable mustard-colored throat pouches. Females are adorned with a modest, mottled brown pattern that affords them excellent camouflage in their traditional grassland habitat. To arrest a precipitous decline in population and ensure survival of the species, federal biologists have wisely proposed to declare the bird endangeredunder the Endangered Species Act, and to designate 1.7 million acres in Colorado and Utah ascritical habitat for the estimated 4,612 survivors.